I am going though all of my hives right now – more on the “what I do” in the next blog – but I thought my “two hives in one” moment was quite interesting. Last year I took part in a beeinformed.org bee health survey . The last month I was willing to run a test was in October. 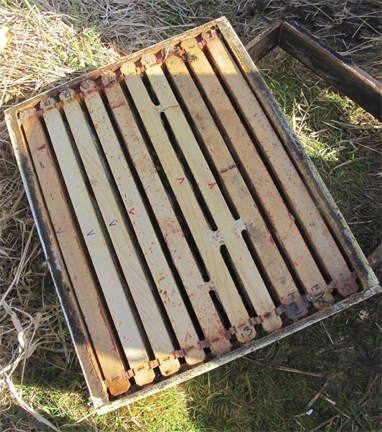 I never open my hives in October – it is just too cold. But I wanted to know if the natural treatments I use really work (last year: Nozevit and Mite Away Quick Strips – formic acid). The results are here. All of the eight hives I tested still had eggs and/or brood, except one. So there I am, worrying: does this hive, a really strong hive, have a queen? As I have mentioned, to say “Karen worries” is about like saying “The earth revolves around the sun”. It’s a given; I worry. Next to this hive is a nuc with a nice little queen. It was a good nuc, but not big enough to make it though the winter. 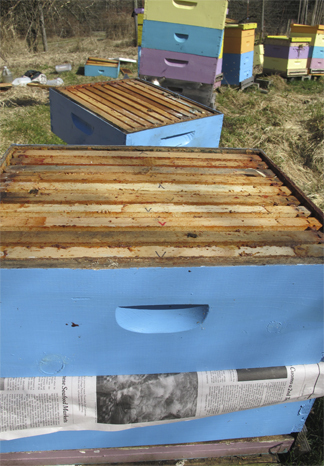 That evening, using the newspaper method, I merged the two hives. I did not move anything in either hive. 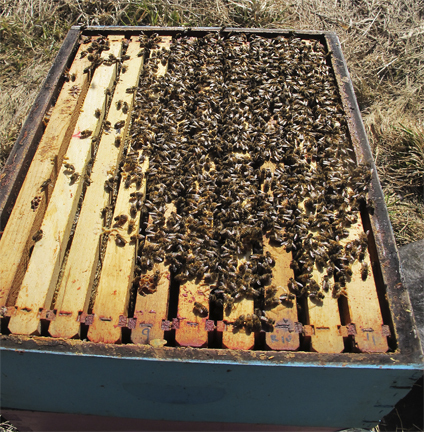 This means that the nuc went above a box with 6 frames of honey in the center and 4 empty frames on the side – I figured if the lower bees needed a queen, they would come find her. A week later I pulled the newspaper, thinking, “Well, I’ve either saved a hive or condemned the weaker queen to death”. Then I went home and winter set in. This week, I was working down the hives in that bee yard. At that moment I’d totally forgotten about the merge. I do keep notes; I just hadn’t read them. I pulled the top off of the hive and there was a nice little cluster. I don’t expect, or want, big clusters here at this time of year. We’re still about a month away from any substantial nectar flow, and it’s raining about 50% of the time. I just like so see a nice cluster with some eggs and possibly brood. I set the top box, with eggs, and probably the queen, aside and start down the boxes (it was a really tall hive due to the merge). 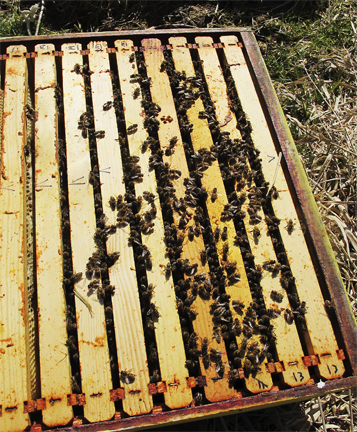 Next box down – fairly empty, some honey. Set it aside. Next box – lots of honey. Pick it up to set aside. – a substantial cluster of bees. “What the??? ?” I thought, and then remembered the merge. I gently open these frames, and sure enough there’s eggs and brood down there too. I am elated, and grumpy. The elation is obvious: I’ve got two good hives in one. The grump was because I was tired. It was the end of the day, I had one more hive to go, and now I’d have to come back after dark and move the upper queen and her boxes. Because the merge had taken place over a “wall” of honey, the two hives lived happily together. Bees really don’t like to cross solid honey unless there’s a reason. Had the bottom box been queenless, those bees would have had a reason to head for the queen upstairs. I did have that one last hive to work. So, after tidying up the two-queen hive, I rebuilt it with its wall of honey in place, knowing I’d come back later. The next hive was grumpier than I. There were lots of bees, but they were not pleased. I soon discovered why: they had no queen. She must have recently died, as there were no laying workers. Just lots and lots of angry ones. So I cheated. It was late, but not dark. Foragers were still out. I picked up the top queen-right boxes from my two-queen hive, and merged them, and their queen, with the queenless hive. I always have newspaper with me for these emergencies. 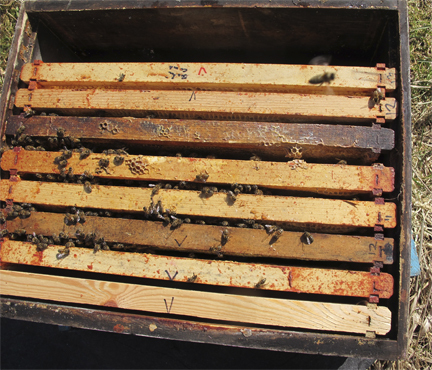 I figured the foragers from the queen-right boxes would go back to what had been the 2-queen hive. But the queenless hive had more than enough workers so I think they’ll be fine. I’ll head back this week (when it stops raining), and pull the newspaper. One of the things I like about beekeeping is its surprises and challenges. I never know what I’m going to encounter when I open a hive. Sometimes it’s depressing (the bees are there, but they’re dead), and sometimes, like this, it is joyful. Keeps me on my toes. Any surprises in your hives? Do tell – beekeeping has so many mysteries – and they are all fascinating. 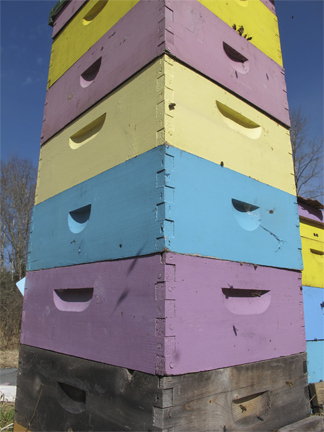 This entry was posted in Beekeeping, Brookfield Farm Bee Yards, Queen Rearing : Honeybees and tagged Beekeeping, bees, Brookfield Farm, hive, honeybees, Maple Falls, over winter, queens, two, Washington. Bookmark the permalink.